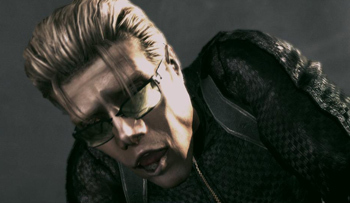 The Wesker & Son butcher's shop will allow Londoners to "sample and purchase a dizzying array of edible human limbs." To promote the impending launch of Resident Evil 6, Capcom has turned to an age-old marketing trick; Pseudocannibalism. The Wesker & Son human butchery opens tomorrow in London's famous Smithfield meat market. The stall will offer "a dizzying array of edible human limbs including hands, feet and a human head," as well as a few classy cocktails with titles like "Puss" or "Stool Sample." "Gamers will be able to buy 'Peppered Human & Lemon Sausages' and 'J'avo Caught Human Thigh Steaks,'" adds Capcom, "along with some specially made pots of Red Herb and Green Herb." No mention of a Jill sandwich or steaks with COMPLETE GLOBAL MARINATION, which means whoever organized this event should be fired immediately. Now normally I wouldn't feel the need to point out something so obvious, but this is Capcom we're talking about, so to be clear: This isn't actually human meat, it's animal meat with makeup. The stall's produce is the work of food artist, Sharon Baker, with help from food businesses, Tongue N Cheek and Homemade Hampers. If pretending to be a cannibal and drinking cocktails from specimen bags isn't your thing, Capcom is also planning a set of lectures at St. Bartholomew's Hospital Pathology Museum. The lectures, spread across two days, explain the themes of Resident Evil 6 and how they relate to the real world. Resident Evil 6 is due for release on 360 and PS3 on October 2nd, with a PC port to follow in November.